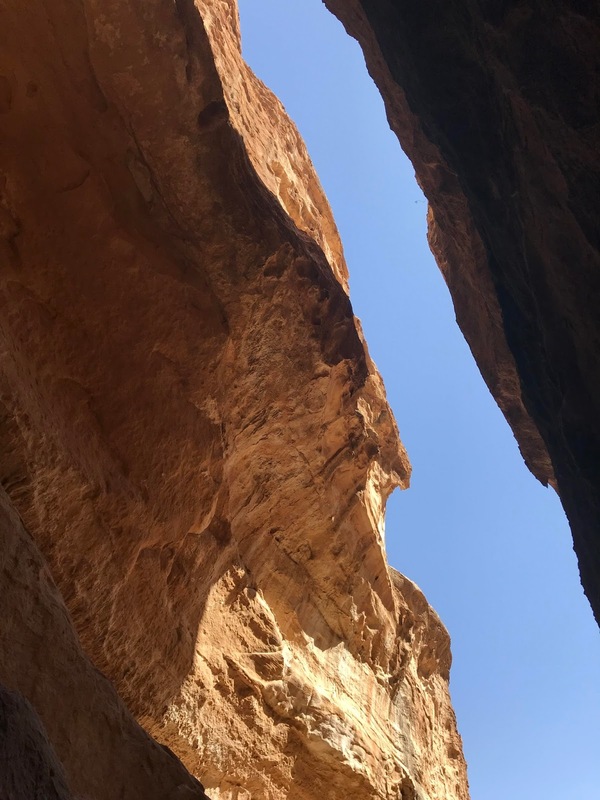 Having spent two full days at the main site in Petra (you can read about them here and here) on our final day, and as we only got a two day ticket, we decided to visit the site of Little Petra, north of the main site. After another hearty breakfast we met our taxi driver as planned and arranged with him to take us there. Unlike the main site entrance, here it is free to enter and no tickets are required. 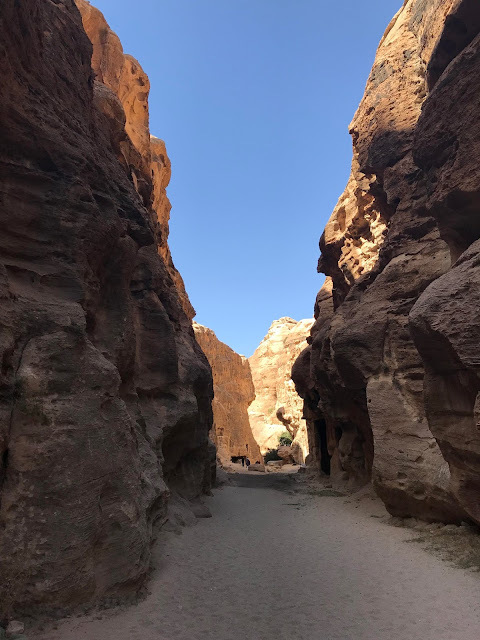 It is a lot smaller than the main site, you probably only need a couple of hours there (depending on whether you choose to just look at the main area or explore a bit further) and, perhaps not unsurprisingly, it is a lot lot quieter but it's well worth a visit too. To get there you really do need to have arranged transport, although there is a hike you can follow from there back to the Monastery it requires a guide as the route is tricky to find and is apparently a four hour walk so we opted out of that one. 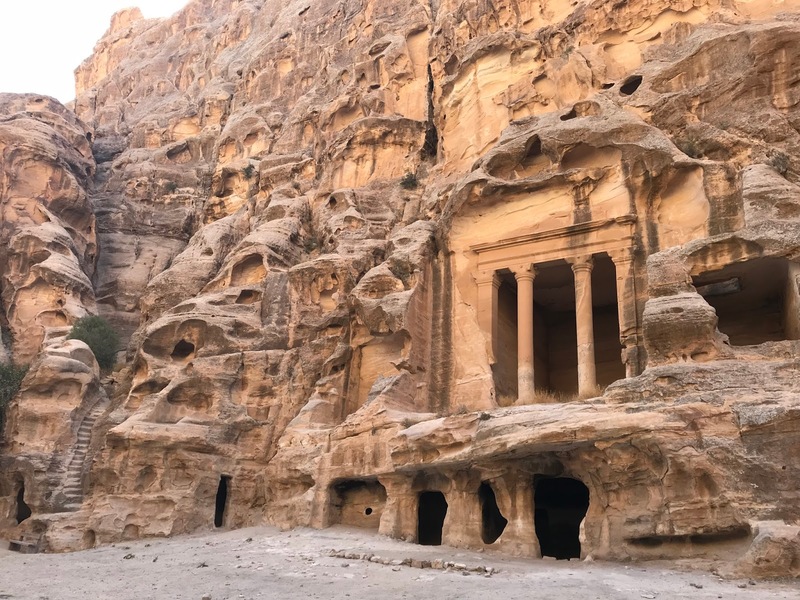 Little Petra, or Siq al-Barid which means Cold Canyon, a name possibly derived from the high walls of the canyon which block out much of the sunlight, was most likely also built at the height of the Nabataean influence during the 1st century BC. 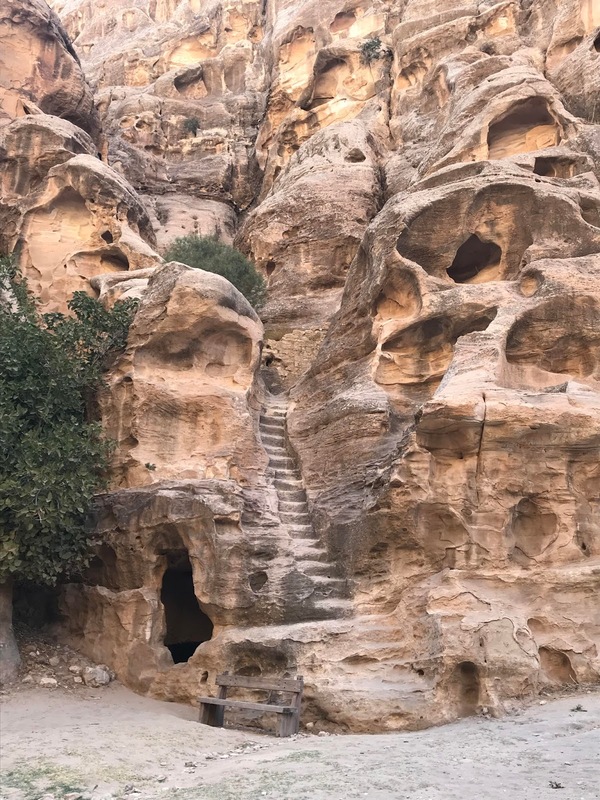 Although archaeologists are not sure what all the buildings were for it is believed to have been a suburb of Petra serving as an agricultural centre, trading area and re-supply post for camel caravans. 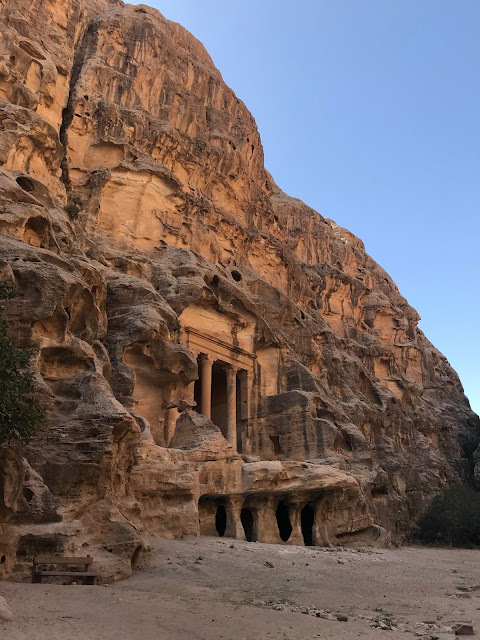 Just as with the main site at Petra when the Nabataean influence declined it fell into disuse and the area became unknown other than by the local Bedouin. When you first enter the site there are a handful of souvenir stalls, some toilets and a teahouse and from there, just as with the main site at Petra, you walk through a Siq, much smaller this time around, which opens out into a wider area. This initial open space includes a temple and some other open areas which may have been used as dining rooms for hungry merchants and travellers. 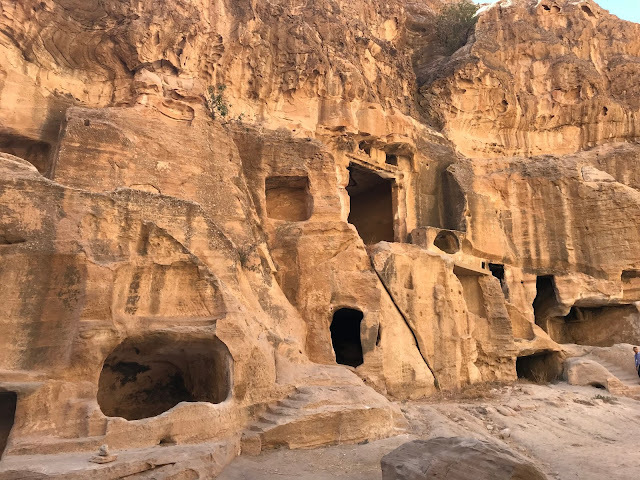 Possibly the most interesting part of the site though is what is known as the Painted House (in my photo below) which has within it some very rare examples of Nabataean fresco paintings. So rare in fact that they are the only examples of Nabataean paintings in situ. They were discovered by archaeologists in the 1980s having previously been concealed by the soot from years of Bedouin fires. 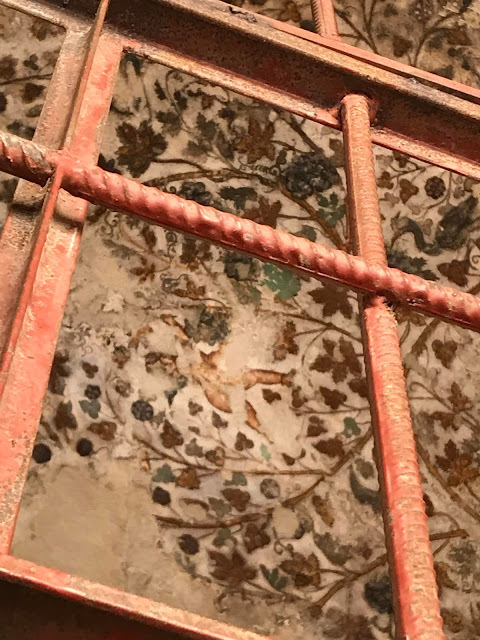 Despite them being so rare you can climb up the well worn steps to enter the house and view these frescoes close up, though they are behind a locked gate. 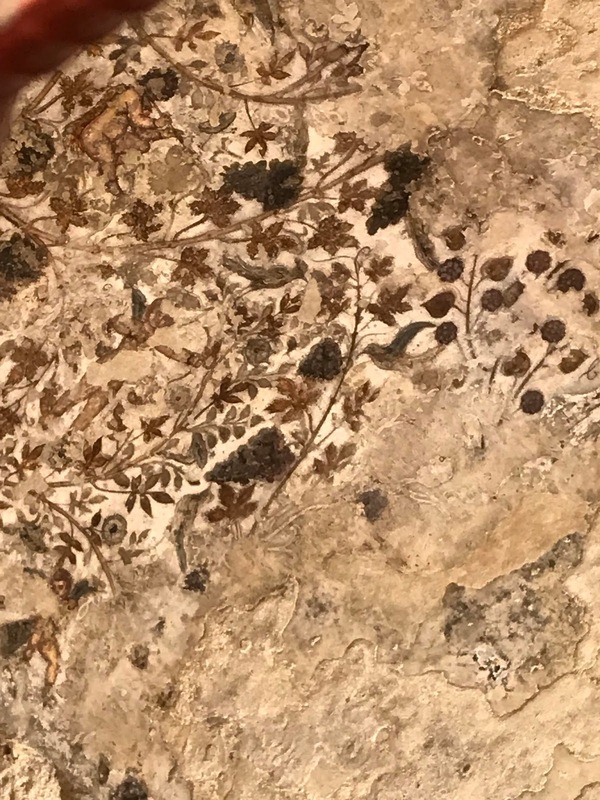 They show images of vines, flowers and birds, with some of the species of grapes and birds even being able to be identified, and really are quite beautiful. With Little Petra being empty in comparison to the main site it makes viewing these rare frescoes very easy and also means you can admire them for as long as you wish with very little interruption. Beyond the Painted House the canyon narrows considerably and, if you wish, at the end of it there are some very worn and in places not really steps at all that you can climb to a further viewpoint. Despite a sign at the bottom claiming that this was 'the best view in the world' we didn't make the climb. Well we started the climb but I'm afraid I chickened out half way up mainly because I was a bit nervous about having to come back down them again. My husband carried on a bit further but he too decided the descent was going to be a bit too nerve-whacking to continue. The photo below shows how far I did get (there was still a way to go) and hopefully you can see what I mean about the steps, or lack of, by that point. Nonetheless being as high as I was I still got some good views looking back the way we had come. On our visit we only explored the main area of Little Petra. There are however a couple of other trails around which you can also visit if you wish. I mentioned the hike from here back to the Monastery before but there are also other ancient ruins in the vicinity that can be seen. 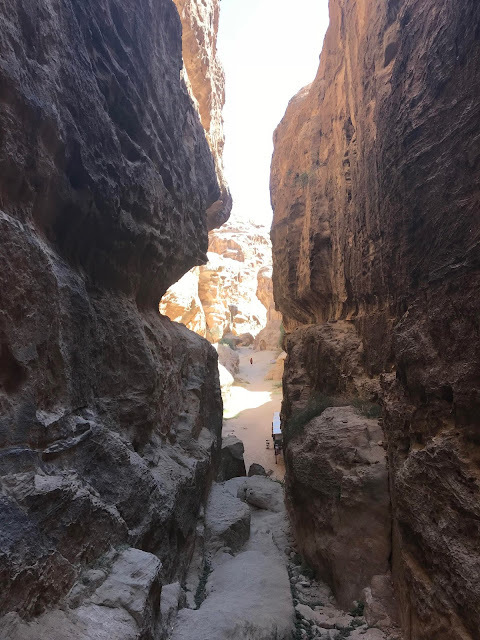 To have been and seen just some of Petra, there are lots more points of interest in the wider area, trails etc. for the more adventurous or those with more time there, still hasn't quite sunk in yet. It's somewhere I never thought I'd be visiting, the scenery and history was just mind blowing, the locals were so welcoming and friendly and the food delicious. Jordan has definitely climbed up the ranks into my favourite country's list and is somewhere I truly hope I get to return to some day. Amazing!